Pictured following the awarding to IT Carlow Boxing Club of the Student Sport Ireland Event of the Year 2016-17 for its “Showdown in the Barrow” boxing event, from left: Carmel Lynch, Chairperson of Student Sport Ireland; Donal McNally, Director of Sport IT Carlow; Eoghan Chelmiah, student member, IT Carlow Boxing Club; Lindsay Peat, Irish Rugby International (Special Guest); Jake McNally, student member, IT Carlow Boxing Club; Paula Hickey, IT Carlow Sports Centre Supervisor; Jackie Kinch, IT Carlow Clubs and Societies Intern. 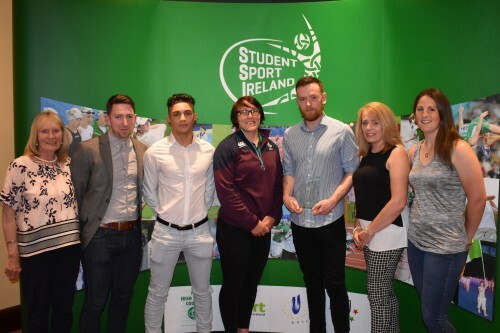 This year’s Student Sport Ireland Event of the Year Award was presented to IT Carlow Boxing club for their hosting of IT Carlow Fight Night, “Showdown in the Barrow”. The award ceremony took place at the recent Student Sport Ireland Network Event in the Hilton Hotel Templepatrick. The fight night took place on Tuesday the 8th of December 2016 following eight weeks of hard work and planning leading up to the event by IT Carlow Boxing Club, the Students Union, students in the Department of Science and Health and supported by the Sports Office and Estates Department. The success of IT Carlow’ “Showdown in the Barrow” could be attributed to the joined up collaborative effort of IT Carlow Boxing Club and students in the Department of Science and Health. Their brief at the outset was to create an event to showcase, beginner and intermediate third level boxers in colleges across Ireland. This was achieved in front of a sell-out crowd of 350 spectators including the Chairperson and Secretary of the IATBA, with weigh- in’s, twelve evenly matched bouts, an MC for the night, IABA referees and judges, individualized entrance music, a match programme, trussing, lighting and smoke all part of the attraction. Delivering a quality intercollegiate event of this magnitude can come at a significant cost, however the organizing committee utilized all resources and managed to run the event at a profit, making nearly €1000 for the boxing club after a major fundraising push, while also securing sponsorship from local businesses for all 12 fights. To promote the event, a strong social media campaign was put in place with posters and video clips posted on several different platforms including, Facebook, Twitter, Instagram and Snapchat. The organizing committee also undertook a pre-event on campus to advertise the Fight Night one week before the main event and included a skipathon, Hang Tough competition as well as the opportunity to spar against IT Carlow boxing club members. The skipathon, sparring and hang tough competition captured the imagination of the student body and raised money for the Boxing Fight Night, which was used to purchase trophies for all boxers competing on the night. IT Carlow Boxing Club student members Jake McNally and Eoghan Chelmiah were presented with the award on the night by special guest and Irish Rugby International Lindsay Peat.